When I posted about the heart mini I was going to make, I checked with the missionaries’ mother-in-law for her favorite colors. Pink and turquoise were the choice, so off to Hobby Lobby I went and picked up a half yard of each turquoise/teal that struck my fancy and the solid. I’m thinking it may be the outer border or binding, still in the planning stages. So 2 yds in, pink to shop for next, and then a mini to make…hoping I have enough left over to make an extra! 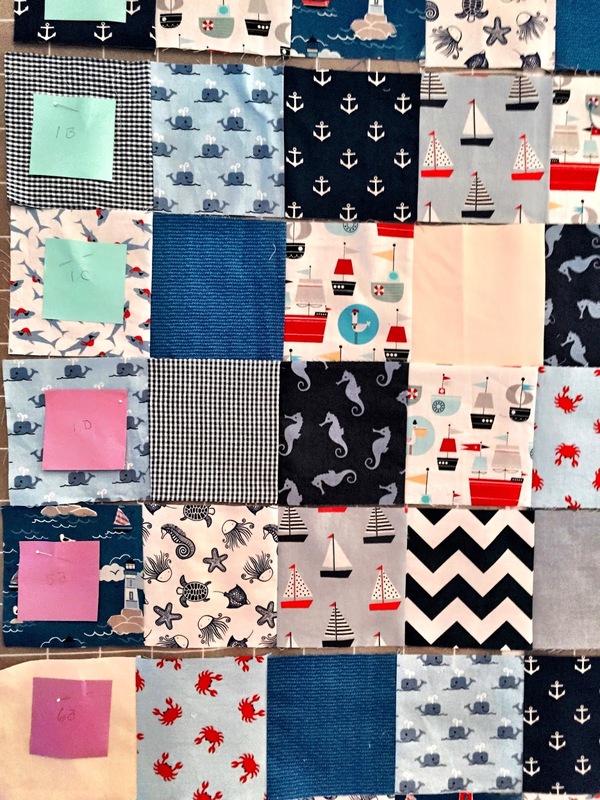 I have sewn all the blocks together on the nautical baby quilt. I label each row until the entire top is sewn together. That’s my next step. I love this whale print. Definitely one of my favorites. And another favorite fabric in this quilt is shown in the photo below. It has a white background with Navy Blue Jelly Fish, Star Fish and Sea Turtles. There are nine rows all together. I am hoping that this will be finished with the light blue borders sewn on by Monday. Not much else to share, other than it’s very hot and humid in the Hudson Valley this week. It’s okay with me. I don’t miss winter one bit. Happy Quilting and stay cool!! 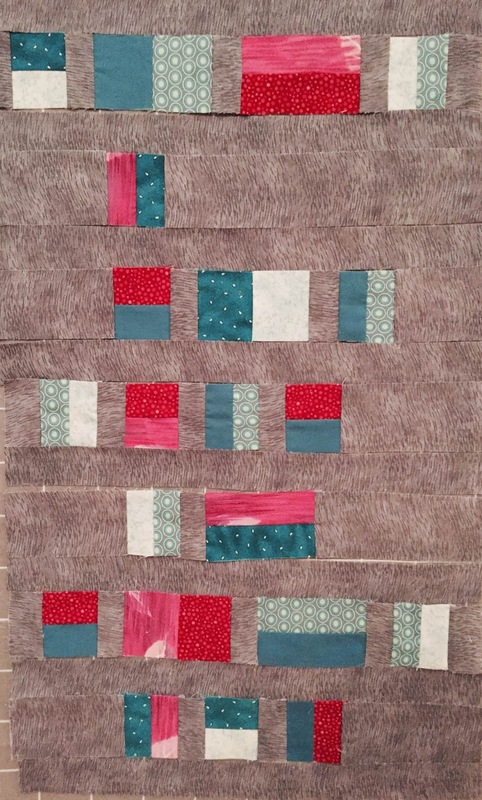 Linking up with WIP Wednesday at Freshly Pieced and Let’s be Social at Sew Fresh Quilts. 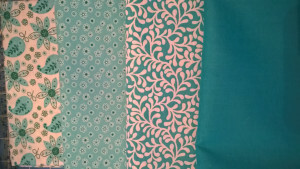 Earlier this month, I posted my fabrics for the Midnight Mystery QAL, that Cheryl@ Meadow Mist Designs, is sponsoring. It’s still not too late to join. Click here for more details. 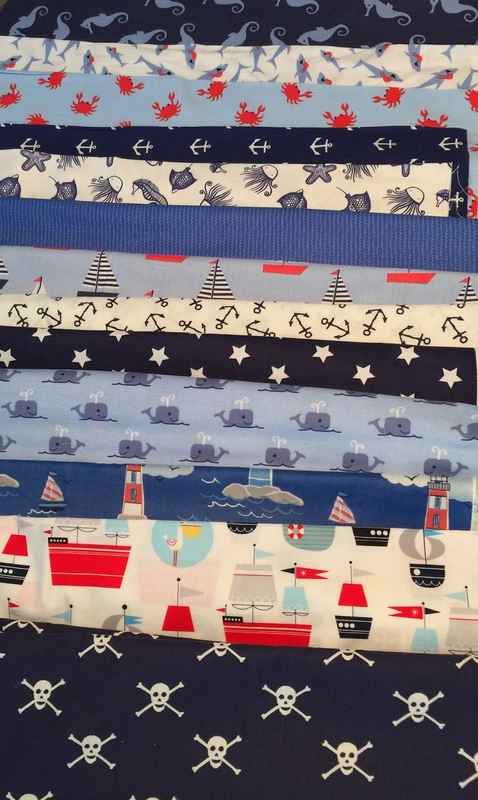 These were my original fabrics below. I love the way these fabrics look together. My “A” fabric is directional, with text, which just will be a bit tricky when it gets cut into HST. 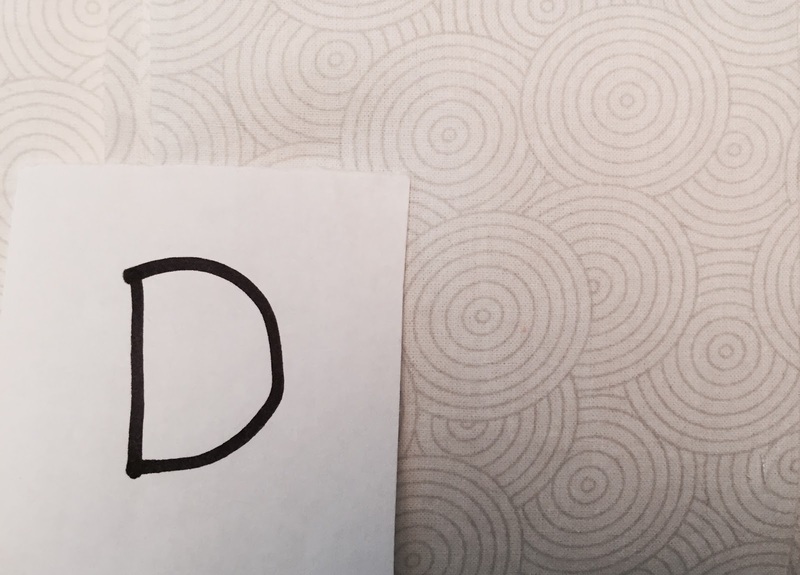 I found out that “A” would be easier to work with if it were a non-directional fabric. I did peek, because I really need to do the August and September steps for this quilt, because we will be away for most of September. When we get back, I will be caught up with everyone else. In the meantime, I promised Cheryl no photos, except for the ones that coordinate with the month we are all working on. 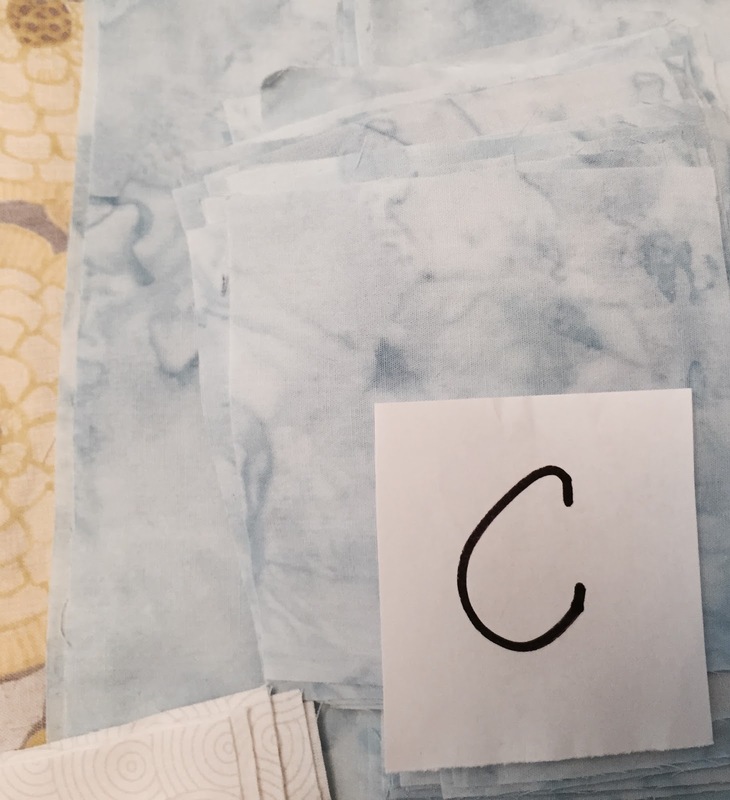 My new “A” fabric keeps the dark blue in the mix the way I planned, and also uses medium blue for the fruit. My “C” fabric below is a light blue marble print, and shows up much better in this photo. And my “D” fabric shows up much better in this close up. I love these gray swirls, and purchased a lot of yardage. It goes with everything, and would be great for backing fabric too. In the meantime, I have to get back to working on the three baby quilts. Looking forward to posting more on them later this week. Currently, I am working on several baby quilts, not to mention the other quilts that are not. Honestly, I’m not positive how many WIP’s; it’s somewhere between 5-10. That’s the most I’ve ever had!! My very close friend’s daughter, Erica, who is the mom to be, is expecting a baby boy around Thanksgiving. Did you know that pirates are a very popular theme for babies now? She purchased a onesy with a scull and crossbones on it from Nordstrom’s at the sale. And, this motif is really popular. 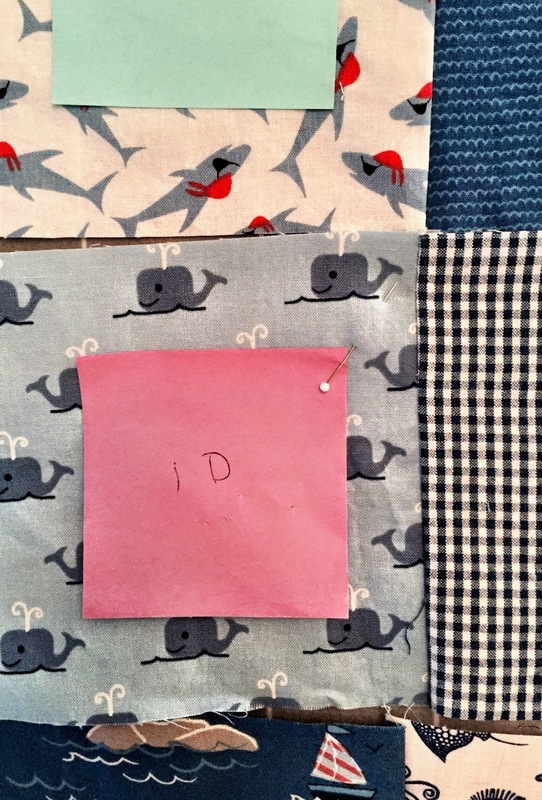 So I let Erica and her mom pick out the pattern, which is a simple charm square quilt with a nautical theme. The scull and crossbones fabric will be the backing fabric and the binding. Here are some close-ups of the fabrics. And this is the layout as of now. I’m sure I will change it around a bit by tomorrow. I was itching to start sewing tonight, but I know, I am more pleased with my layouts when I reexamine them the next day. So I will wait. 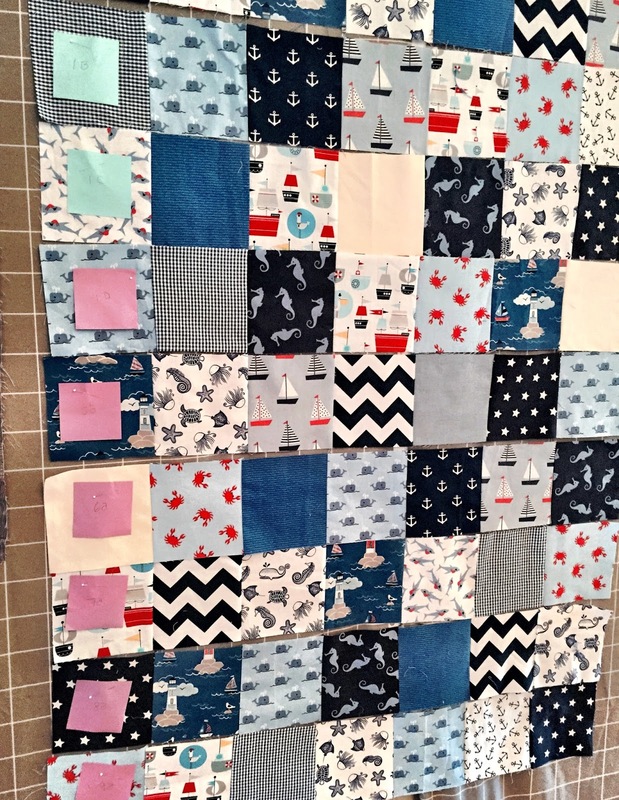 The other two baby quilts in progress are; a low volume quilt with coral and Aqua squares, (Mom’s choice – Lisa). The pattern is by Brenda Ratliff from@justabitfrayed, and Pink Castle Fabrics. This pattern also uses text fabrics. It’s perfect for my cousin Jordan, and his wife Lisa, and their little girl; Marigold Louise from LA. Everyone is calling her, Goldie. She is so cute!! The third baby quilt is for my friend Tom and his wife, and their second child, Clara. The pattern is spools of thread. I chose that pattern, because they own Colonial Needle and Presencia Thread. And, I am a huge fan of their products. Today I am linking up with Lee at Freshly Modern Pieced. 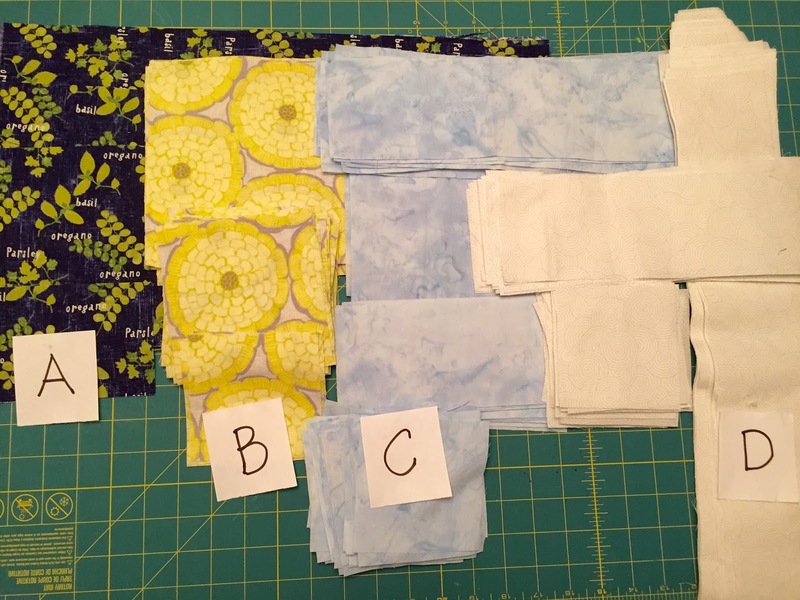 Cheryl over at Meadow Mist Designs is having a mystery quilt QAL, that I am participating in. 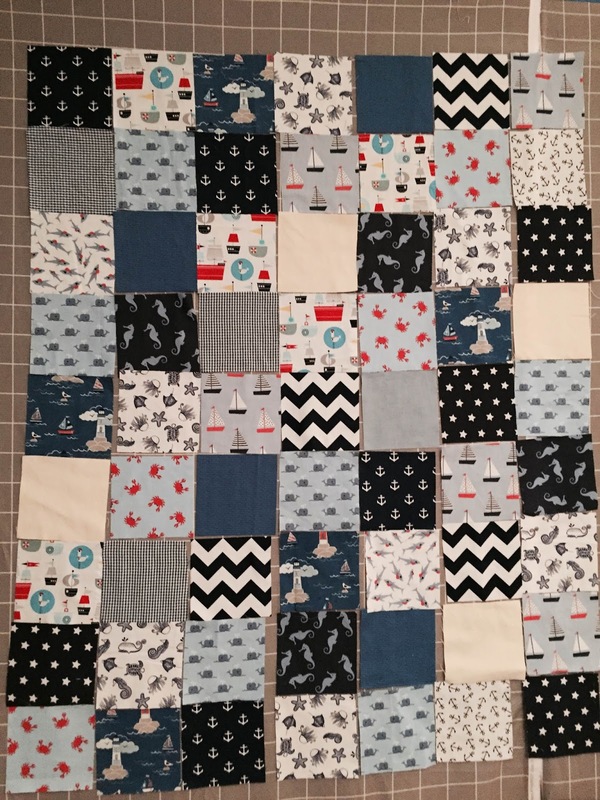 I have never made a Mystery Quilt, but I have participated in a QAL. I have a strong feeling that this is going to be a lot of fun. The July instructions came with cutting instructions for the four fabrics that I picked in June. 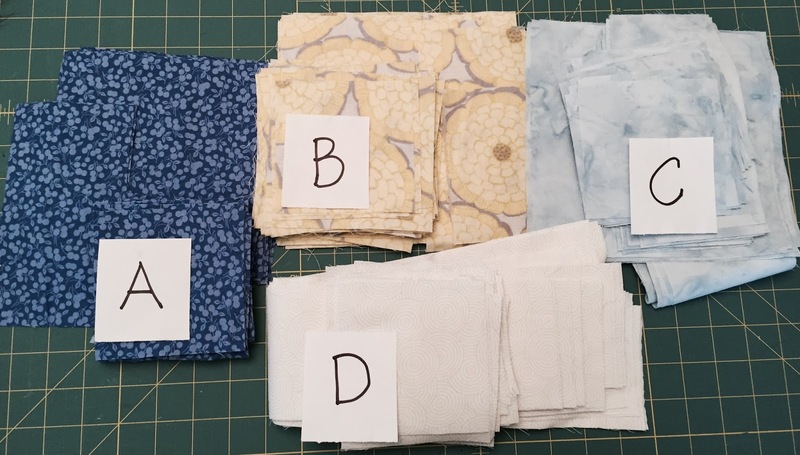 My fabrics are below, and ready for August sewing instructions. I love the way A and B look together. In this photo, you can see the details in the design of fabrics C and D.
These are all four fabrics together. Needless to say, I am so excited to be doing this, and sharing it with you. 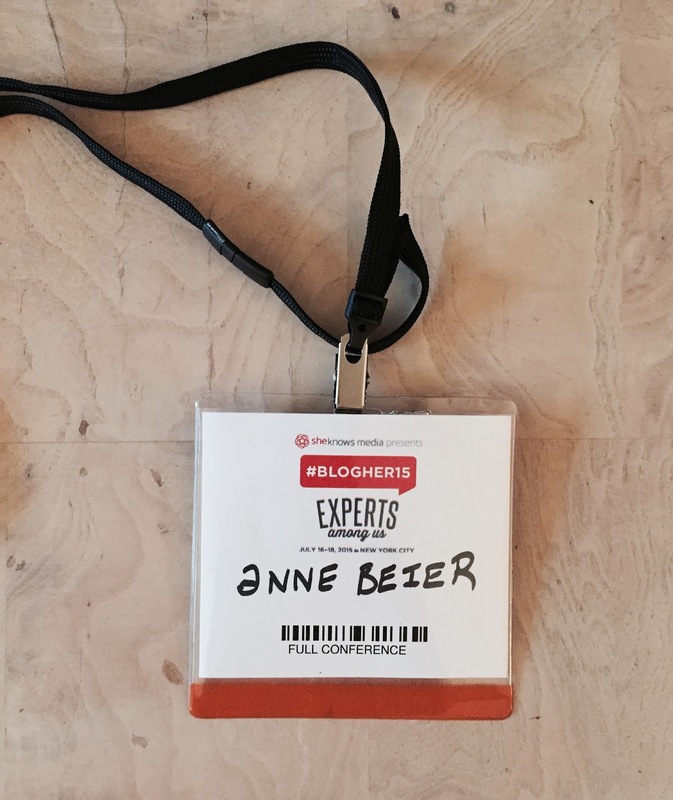 Friday and Saturday, I will be in NYC at the BlogHer Conference, and look forward to sharing with you what happens next week, and what I learn. 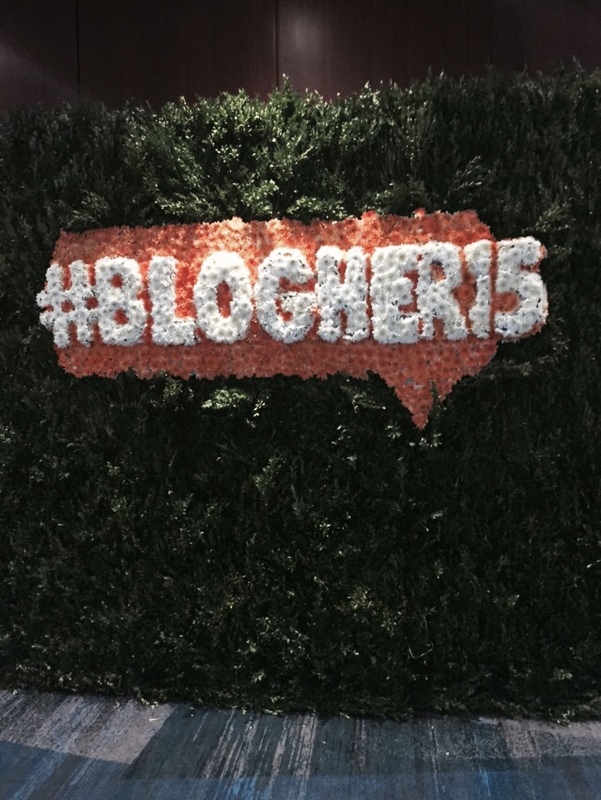 It is the first time they have had a BlogHer Conference this close to where we live. 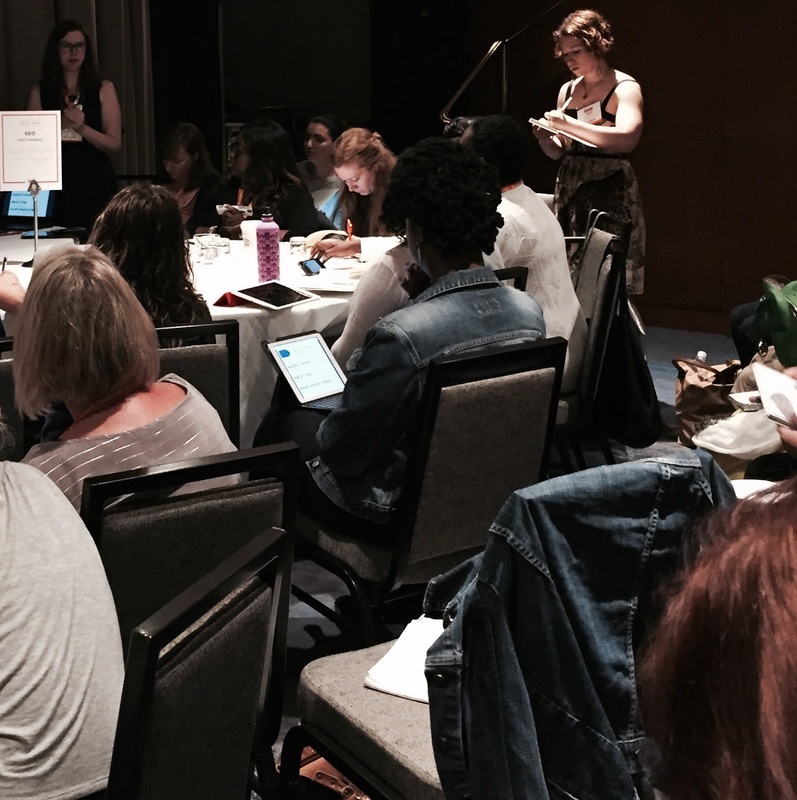 The workshop choices are plentiful, and I feel overwhelmed already, because some of the class modules I’m interested in attending are being given at the same time. 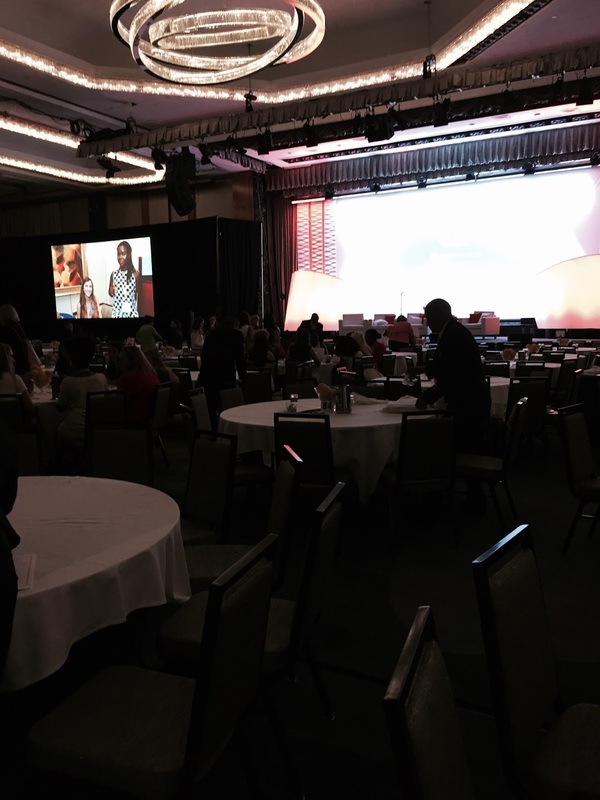 But I know I will learn so much and am looking forward to this whole experience. (Except parking in the city). Have a great weekend and Happy Quilting!! The quilt top for the mini-quilt, paint chip challenge is finished. I wasn’t happy with the way it first came out, so I changed it up a bit. I thought this pattern was a good choice. The abstract composition gave me the feeling of random chaos. Before I sewed the strips together in the first version, above, I thought the random chaoticness didn’t communicate that at all. So I did some playing with the fabrics, color combinations, the sizes of the blocks, and their positions. On the second row, I added a long block. On the fourth row, I added a block, using two half – square triangles. It provided enough change to really give it that “randomness” I wanted it to have. One of the comments I received The Colorful Fabriholic, said, not to go lighter with the binding, and she is right. (Thank you to all who commented). It would make the grey, which I’m trying to draw attention away from, more attention. Too late last night I auditioned some bindings, and the darker blue used in some of the squares seems like a good choice. I’m going to sit with that idea for awhile, while I baste and machine quilt, and see if I still feel the same way when it’s time to add the binding, and I’m not tired. More to come, and I need to get started on a pirate baby quilt, and a girl’s baby quilt during the next few days. On another note, the anniversary issue of Make Modern e-zine is now on sale. I want to make this clear to all of my readers. I am not praising this magazine, because I am one of the writers. 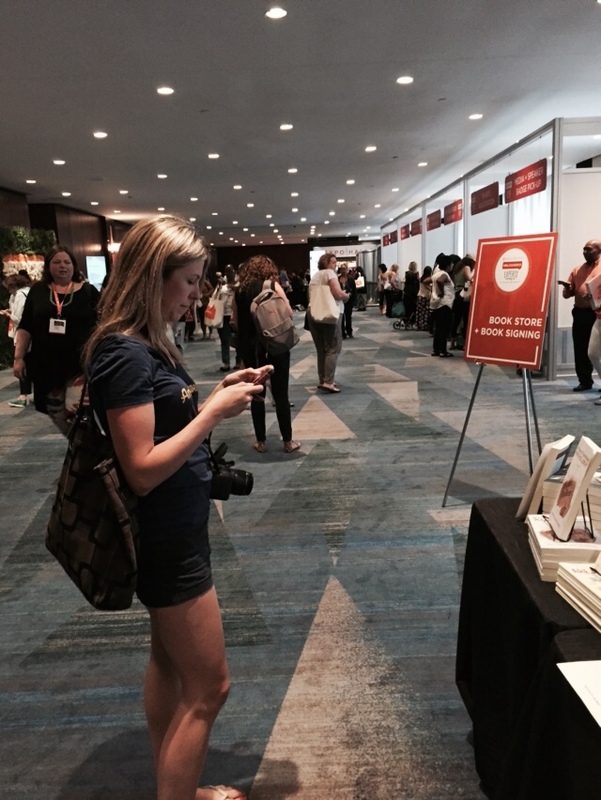 I wouldn’t write for any publisher or publication that I didn’t feel produced a stellar product. It is my opinion that if you enjoyed Hey Quilty! !, you are going to love Make Modern. 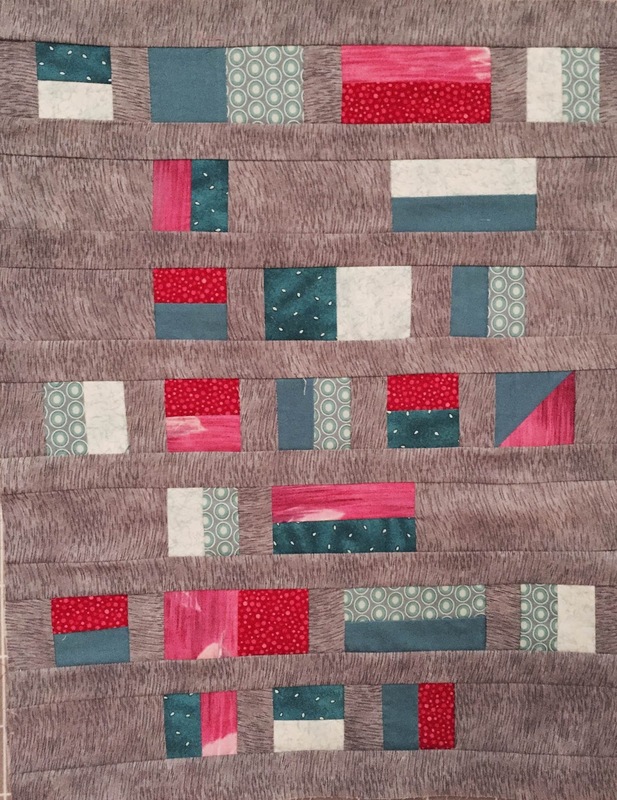 Along with feature articles about everything to do with modern quilting and sewing, there are patterns from some very talented quilters and quilt bloggers. 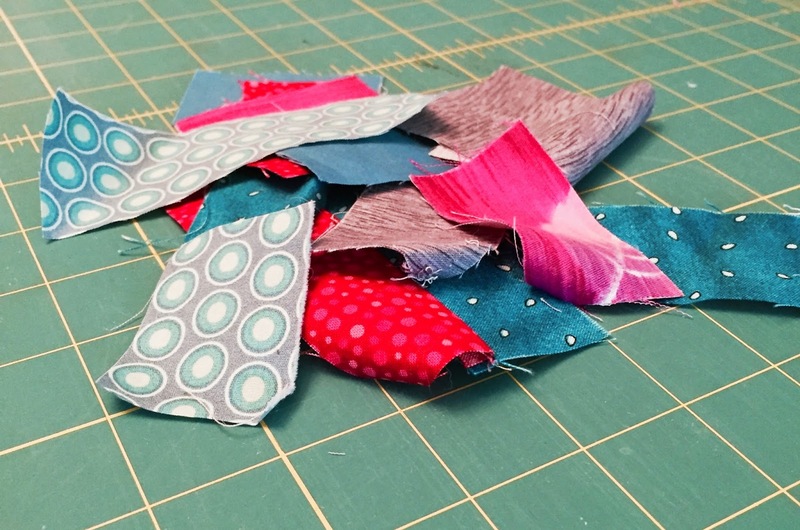 This bimonthly e-zine, also covers quilting math, book reviews, give-a-ways, and tons of recommended quilting and sewing resources to help readers reach their quilting goals. The photographs are stunning. Who doesn’t love that? I’ve been working away on this WIP, and gathering fabrics for a pirate baby themed quilt, for my friends daughter, and her husband, who are expecting around Thanksgiving. (I will be posting more about that this week). 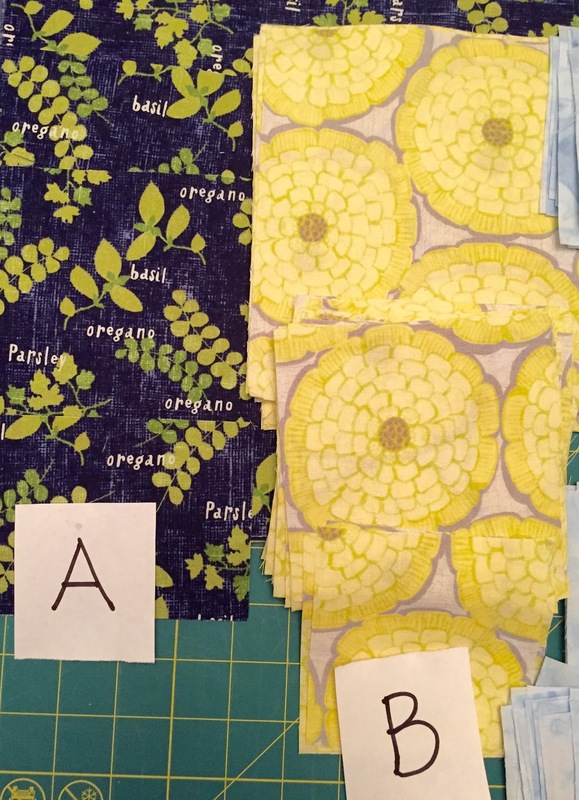 I’ve also been scrambling to get my fabrics together, washed and cut for Cheryl’s Mystery Quilt; see her site Meadow Mist designs. And these are the most immediate WIP’s that have “hurry it up,” deadlines. Some of my other projects have been pushed down to 4, 5 and six on the priority WIP project list. A quick digression – I hope everyone had a great Fourth of July weekend. We visited some friends on Candlewood Lake and had a great time. My other mission during this holiday weekend was to work on my quilt guild’s paint chip, mini-quilt challenge. 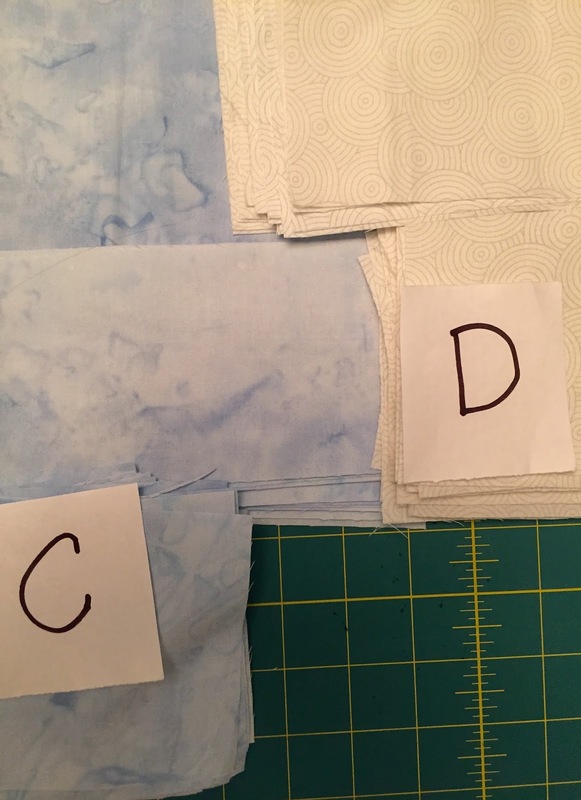 Above are leftover fabric scraps that I will incorporate into the back, using mostly, light blue solid fabric. Below are all the rows, finally finished. By tomorrow they will be sewn together, and I can begin work on the back and binding. I’ll be honest, I don’t love how this is coming out so far. It’s the grey fabric that I used in the background that I’m not so crazy about. On the positive side, it gives the piece movement and texture. On the negative side, it looks like a weird piece of minky fabric. I wasn’t not intending for that to be the look. In retrospect, I wish I had used light blue for the background and the grey fabric for some of the small pieces. So for now, I’ll hold off on my disappointment with this piece until it’s finished. That light blue binding may be just the thing that tones the grey background fabric down. Linking up today with WIP Wednesdays at Freshly Pieced.